At the age of eight, feminist studies professor Bettina Aptheker watched her father testify on television at the McCarthy Hearings in 1953. The daughter of historian and U.S. Communist Party leader Herbert Aptheker, she grew up in a lively home environment that often included spirited visits by such renowned family friends as W. E. B. DuBois and Paul Robeson. In her new book, Intimate Politics: How I Grew up Red, Fought for Free Speech, and Became a Feminist Rebel, Aptheker tells a fascinating story of her life—a life that traces her role in major historical and political events ranging from her co-leadership of the Free Speech Movement in Berkeley, the movement against the war in Vietnam, and the trial of Angela Davis, to the building of the Women’s Studies Department at UCSC. Described by The Chronicle of Higher Education as “a stunning new memoir” the book does not shy away from documenting Aptheker’s childhood sexual abuse by her father, her illegal, pre-Roe abortion in Mexico, her battle with severe depression, and a sexually abusive relationship. But as she took on prominent roles in the politically turbulent events of the 1960s and ‘70s, Aptheker describes how she eventually comes to terms with her lesbian identity and political convictions--becoming in the process a prominent feminist leader and activist. A scholar of history with a national reputation for her talents as an instructor, Aptheker has been teaching one of the country’s largest and most influential introductory feminist studies courses for the past 24 years at UCSC. Starting out in 1980 as the sole lecturer in UCSC’s Women’s Studies Department, she became the department’s first ladder-rank faculty member in 1987. Aptheker was honored with the Alumni Association’s Distinguished Teaching Award in 2001. She is also the author of The Morning Breaks: The Trial of Angela Davis (Cornell University Press, 1997) and Tapestries of Life: Women’s Work, Women’s Consciousness, and the Meaning of Daily Experience (University of Massachusetts Press, 1982). 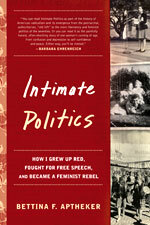 Bettina Aptheker will celebrate the publication of Intimate Politics with a book reading/signing event at Bookshop Santa Cruz on November 2 at 7:30 p.m.